I put together a cross-platform wrapper, so the release package *should* also work on grown-up computers with Python, PyOpenGL and an mp3-and-png-supporting build of PyGame installed. That was a real fun! And + for the platform! It will probably look crappier in retrospect. Refreshing. I actually got hungry after watching! Raspberry Pi is a platform with a lot of potential. Thanks for feeding my Pi! The Pi(e) is no lie! Made me hungry for more. Piggy for the prod itself, but thumb for the idea and the cross-platform wrapper! Quite nice because of its length. Let's put all the euphoria for the platform aside and be serious about it: the demo is just bad. This prevents my thumb from raising, sorry. Let's put all the euphoria aside and be serious that gasman just can do stuff on everything that somehow can be programmed. Sure it's no Debris, but kudos for platform, effort and delivering! Let's put all the euphoria for the platform aside and be serious about it: this demo is fun, original and has a very nice soundtrack. added on the 2012-08-18 19:38:34 by ɧ4ɾɗվ. It's mildly entertaining but what KeyJ said :). Looking forward to the first proper demos on the platform! Just ran it on real RPi, but seems to be a bit buggy. Doesn't quit, there's a loud crack in the tune at the beginning and the final screen shows the terminal when fading in. Tried a different memory split, a bit better with 128/128. Vanilla Raspbian and PAL video out. The visible terminal glitch was annoying... I discovered it 5 minutes before the compo, because during development I was always running it over SSH (which meant that the screen blanker kicked in after the first ten minutes of work). I'll know about it for next time, at least! Well, the purpose wasn't to point fingers or anything :) I was just wondering whether some of those "features" are well-known or whether it's just my setup (or if the kernel/libs have changed in some respect). I just had this for breakfast! 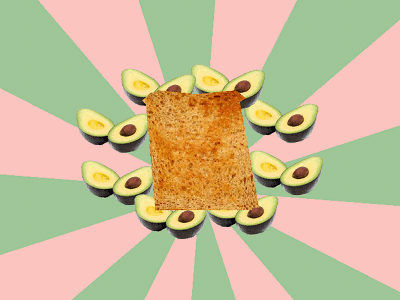 Whenever I have avocado on toast, I have to hum this tune. And today, finally, I decided to upvote! page created in 0.015785 seconds with 15 queries.